Bootjacks are a functional and utilitarian way to remove boots economically and quickly. It's actually an implement that will hold the heel of one boot while the toe of the other boot holds the jack in place. While pulling the boot up from the jack, the boot will actually remain and allow the wearer to tug his foot free. Most people tend to 'toe' off their boots. This simply means that they are placing the toe of one boot against the back heel of the other, then pushing or shoving the boot off the foot. This isn't really such a problem…..if your boots are old and scuffed. Or if your boots aren't really tight. But the bootjack works wonders if you are wearing a tighter fit boot or if you are wearing a dress boot and don't want the heel to be scuffed up. On the ranch, when I came in for lunch or the end of the day, I admit, I made my kids help me get my boots off. Yes, I was perfectly capable of doing so, but when a mom is tired and her kids are around, isn't that the easiest way to go? However, not everyone has little ones around, kids grow up and sometimes it's just simpler to have a handy bootjack around. WHAT ARE BOOTJACKS MADE OF? I've seen bootjacks made of cast iron, steel, plastic and wood. I've seen square ones, notched ones, ones with elaborate leather carved insets, wood burned ones, ones with rubber pads, I've seen steam-bent wood boot jacks and cast iron 'Naughty Nellie's'. The designs and details are often amazing. And the prices ranges from a few dollars to several hundred. The simple, efficient yet lowly bootjack has evolved into a beautiful device that is both practical and attractive. "Which one should I buy?" you might be wondering. If you are looking for something basic and with no frills, the cheapest boot jack can be yours for under $20. which includes shipping, and if you are a high-end kind of guy or gal, you'll be able to take home and become the proud owner of a drop dead gorgeous bootjack with all the leather trimmings and bells and whistles for no less than $500. Prices usually reflect either the amount of time that goes in to these bootjacks, the supplies used to make them or both. The choices are many and the price ranges are enormous. What does this really all come down to? YOU! For as many people with different tastes and ideas out there, there are just as many boot jack designers. Each one of these people bring their expertise, craftsmanship and their artistry to their work. They bring their passion and their love of creation to bring the public their creation. Rawhide Gifts and Gallery does two styles of bootjacks, The hourglass boot jack and the traditional long "V" shaped bootjack, both stained and unstained. Plain, personalized or just with one of our oak emblems. WHAT DO YOU DO WITH A BOOTJACK? WHAT IS THE HISTORY OF THE BOOT JACK? WHERE DID BOOTJACKS ORIGINATE? 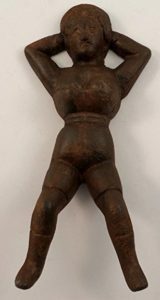 The history and origins of the bootjack appear to be somewhat obscure. I have no doubt, though, that they have been around for quite some time. After all, humans are very inventive and at some point, someone would have been inclined to create something that made taking off tight boots much, much easier. My guess as to why the bootjack appears to have no 'history' might be that the device was considered so humble, so ordinary that nothing much was said of it. It would make sense that, say, Louis and Clarke would write much more about their journey and describe native flora and fauna than to mention before going to sleep they pulled off their boots with a bootjack. However, I did visit a museum near where I live in Wyoming. On display was a bootjack crudely fashioned from a forked branch. Nothing fancy, but in a pinch, it would do the trick. This simple bootjack and the accompanying image defined this bootjack as being from the 1830's. You can bet bootjacks were used long before then! 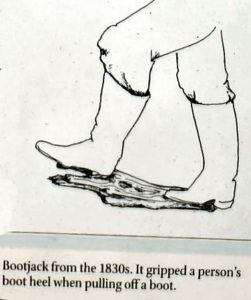 This sketch shows a 'basic' bootjack made of a tree limb. Little weight is actually placed on the bootjack because the toe of the opposite foot holds the jack in place while the heel of the first foot is placed in the 'u' of the bootjack. Slight tugging and the boot is removed from the foot. Cast iron, hard plastic or resin and steel bootjacks are usually mold made. Metals are melted down, poured and left to set until hard. The initial work, the making of the mold which is the most time consuming, has already taken place before hot metals are poured into any bootjack designed sets. Those made from wood and leather require a bit more time and craftsmanship before being finished. Those that have leather work take an enormous amount of time, and talent!, to carve the leather before being fixed to the base area. When done, they are phenomenal. For example, our bootjacks take anywhere from 2 1/2 hours to 3 1/2 hours to make. (A lot of this is drying time). First, the template is used to cut out the base part of the bootjack, Then each one is cut with a band saw. Depending on what needs to be done with each one, (choice of emblem or logo that we put on it, if any personalization or brand gets put on it) we stain the bootjacks. The most popular color seems to be a walnut but it also is the best color to showcase the contrast color of the oak images we put on. When the stain is dry, the edges are routed with a bit that gives the bootjack a nice soft scuff-free interior safe for boot heels. On stained bootjacks, routing the edge also serves the purpose of creating a contrasting light edge against the dark stain in the center. Then it's time to run the bootjack bottom across the table saw to cut a groove for the boot jack leg. No leg…then you have no bootjack! When this is finished, the sanding part comes in. It's time consuming, but very important. Wood fibers will stand up and cause a rough feel on the jack.Often, we will give the bootjack a first coat of polyurethane and, when dry, begin sanding again. This allows the wood fibers to lie down and make it easier for sanding. Time to cut the images we use, (coyote, bucking bronc etc) out of oak veneer. Several same-size pieces are cut and then taped together. An image is traced on the top of these layers of oak veneer and then cut with a scroll saw. Wood glue is brushed on the bottom of each image, then placed on the bootjack and clamped to dry. Waiting time….. When dry, the leg is now attached by gluing in. This is allowed to set to dry. More waiting time…..
Now, the final phase. If there is no personalization requiring branding letters in, and if another type of personalization was used (gluing a hand cut brand for instance, just below the emblem), it's time to give the bootjack several coats of polyurethane. This give it its shine. We usually spray about 5 coats. I have no doubt the much time goes into many of the other bootjack styles I see on line. For no good reason that I can think of, using bootjacks always seemed like a 'western' thing to me. Maybe because I grew up here? But truthfully, if you wear boots, if you ride horses, or if you have a hard time removing your boots…and if you have no children to help you pull 'em off, I say…..use a bootjack! HOW TO CHOOSE A BOOTJACK? 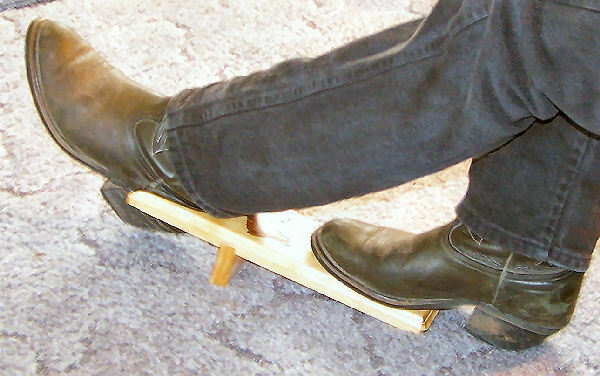 first and foremost, the idea of a bootjack is to get your boot off. Any bootjack will do. But if you are looking for a bootjack that doesn't scuff the heel of your dress boot, then look at the interior U where the boot heel will reside. Many will have leather over it. Consider how long the leather will last and how you will replace it if that is the direction you should go. If you choose one without the leather U insert, look at the interior U. Is it well sanded? Does it have any notches or carving that may scar the heels? Do you rodeo or travel? If so, consider the weight of the bootjack. Is it light enough to pack? Put in a rucksack or shoulder bag? For pure esthetics, think about what you want in a bootjack and it's design. Like something that says country, or humble and simple? You can pick up a nice little rectangular or square bootjack that does the job, doesn't cost much and is easy to put away in the mudroom. Want your bootjack to make a statement? Want it to be seen, and used by, anyone who steps through your door? Want them to 'oooh' and 'ahhh' when they use it? Try a designer bootjack or a naughty Nellie. Plan on commemorating a birthday, graduation, a memory? Maybe you have a western style bed and breakfast hospitality house and want a bootjack for the rooms of each of your guests? Try the middle of the road bootjack that offers some of the personalization you are looking for. The choice and designs of bootjacks are almost as unlimited as your likes and dislikes. Go do some searching! And now, one last plug for our bootjacks…We do personalization and we also do wholesale. We have worked with hotels and bed and breakfasts, If Naughty Nellie is not your cup of tea, please contact us for more info. We will be glad to give you information on what we do.